The Caddo Parish Clerk of Courts has a number of ways to access a variety of records. The office, in general, keeps track of all records for the Parish, including marriages, births and deaths, etc.. Their website has an online public marriage license database that is free to use, as well as web access accounts that require a yearly subscription fee of $360 and allow access to marriage license images stretching back from 04/03/1838 to the present, along with many other civil, criminal, and property records, and others. The marriage license and property records department can be reached via email at records@caddoclerk.com, and by phone at 318-226-6790. 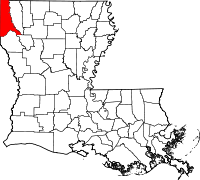 Caddo Parish is the third largest parish in Louisiana with a population of over 270,000, and it is the furthermost northwest parish in the state, located directly in the corner. The parish seat is Shreveport. Search Fee: $30.00 for 1st 10 files; $1.00 each add'l on that search.